Supporting a person's verbal communications means supporting one's human life. 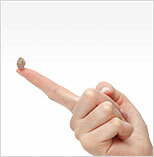 Rion's continuous commitment supports the advancement of hearing instruments. Over 60 years since the first launch of mass-productive hearing instruments in Japan. Consistently pursuing "hearing" and "miniaturization". 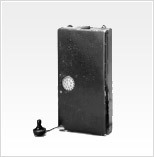 Announced by Rion in 1948, The H-501 was the first hearing instrument to be mass produced in Japan. 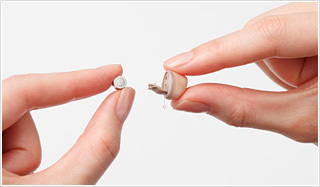 Over the following 60 years Rionet hearing instruments have been supporting communications by making it easier for users to hear, and have been made smaller and smaller to meet strong demands from users for unremarkable devices. In addition to advances in audio processing from radio valve, transistor and through to IC technologies, progressively higher precision component mounting and optimized positioning technologies have led to remarkable improvements in performance and rapid miniaturization of hearing instruments, devices that started out almost as big as a lunchbox. Currently the ultra-compact CIC type hearing instruments are becoming widely popular as they can be almost invisible hidden within the ear. Aiming for good sound to match the hearing of individuals. World-leading digital hearing instruments. The world's first digital hearing instrument announced by Rion in 1991 dramatically changed the history of hearing instruments. This digital signal processing technology made it possible to create the sound with fine adjustment than previous analog type, with functions like multi-channel setting, noise reduction, directional characteristics etc., so the hearing instruments were improved much more to fit for the hearing of each users. Further, it made possible to do the fine fitting for each users with using computer. 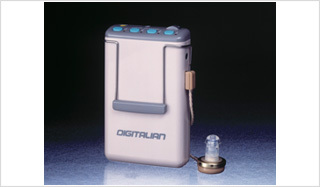 Now digital hearing instruments, pioneered by Rion, are the mainstream of hearing instruments in the world. Hearing instruments to be used in all situations of the life. The first waterproof hearing instrument in the world to be used in bath or swimming pool. 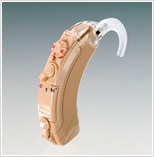 Supporting users' communication in every situations of life, that is the important mission of hearing instruments. Treatment for water problem was one of the most important matter to be solved. It is also Rion to solve this problem. The first waterproof hearing instrument introduced by Rion in 1986 had the performance at the depth of 1 meter, and made the users to use hearing instruments in every situations, like active sports, swimming, shower, bath etc, with contacts with liquids. 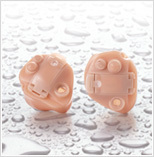 Rion has been leading of this field of waterproof hearing instruments and the latest excellent result was to introduce the BTE waterproof type for severe hearing loss. Continuous support to education for hearing-impaired children in Japan, for testing equipments, the facilities of supporting schools etc. It has been the important mission for Rion to support hearing-impaired children, such as verbal learning etc. For the school for hearing-impaired children, Rion manufactured a group hearing instruments as trial in 1948, and could complete the improved portable unit (as combined player and amplifier) in 1954 and supplied to the schools. Since then, Rion products support the schools for the hearing-impaired children and related fields of education. Rion also have actively been supporting the hearing-impaired babies/infants, to contributing for the newborn hearing screening equipment and to develop the hearing instruments special for children. Dedicated approaches towards realizing a barrier free society for social awareness, reform of system and infrastructure improvement. In the reality of aged society, it was one of the serious social theme to make the quality of life for aged hearing-impaired people better. Rion has been dealing with such problem as the leader of hearing instruments market in Japan. Concerning hearing instruments, Rion cooperates to promote the hearing instruments socialist / doctor system by The Oto-Rhino-Laryngological Society of Japan, Inc. which promotes the spread and the proper use of hearing instruments, as going ahead of the cooperation between the doctors / specialists and the shops and as requesting the subsidization scheme to the government authorities. Rion also has worked for promoting information equipments for the hearing-impaired people in social places. Further the information system / method in disasters for hearing-impaired people is the important examination subject for Rion, based on the experience of Great Disaster in East Japan in 2011. Developing high quality products based on customers' opinions Rion always appreciates for customers' idea and cooperation. Rion has established distributors network in Japan to hear customers' opinion surely. Such opinions are feedbacked to the engineers as the important information for product developments. For example, the user-friendly function, Either-way Circuit (battery can be inserted without caring for +− side with any orientation) was developed from customers' opinion. Rion will contribute to enhance peoples' quality of life and to realize barrier free society.